I’ve already posted a tutorial on bound buttonholes, but I’ve made a few refinements to my technique while sewing the buttonholes on my cape so I’ll share them with you here. There is a small amount of hand sewing involved, but it does reduce a layer of bulk around the buttonhole edges so it is worth it! This gives an accurate guideline where to start and stop stitching. It is especially helpful when doing a line of buttonholes – it helps to keep that line straight, and to achieve parallel buttonholes of equal length at an equal distance from the front edge – I won’t skip this step next time! Next cut a square for the buttonhole welts – I have decided it is better to cut a slight rectangle, or mark the top edge or something, to avoid this! I like to cut mine on the same grain as the front, so the buttonhole is less conspicuous. You can cut them across the grain so they contrast a little more, or cut them on the bias which is nice if you have stripes, or whatever – just cut them all the same way! I am working on the collar stand, which I have blockfused. This helps prevent a) a frayed disaster, and b) frayed nerves! I fused the welt too, but you don’t have to. When weaving in the thread ends, but be sure to weave the ends away from the soon-to-be-clipped area or you will cut them, and your buttonhole will start falling apart! I usually do all my buttonholes to this stage, then check they are all the same size/shape/parallel/etc before the cutting stage. …then clip into the corners. I found this is where those vertical guidelines are of real benefit as they mark the exact point to clip to! Here the advantage of cutting your welts in one piece is revealed – make sure the cut ends of your welt line up for a really square end, like the picture above and not the picture below! I like to stitch across the triangle once just to check everything is square, then backtack across it to secure more fully – having to unpick backtacking at this point is no fun! Alternatively you can trim 1mm off the inner raw edges before binding – this might be necessary for thicker cloths. This is my favourite bound buttonhole method because it has produced my best results to date! It is a ‘true’ bound method where the raw edges really are bound, rather than turned out. 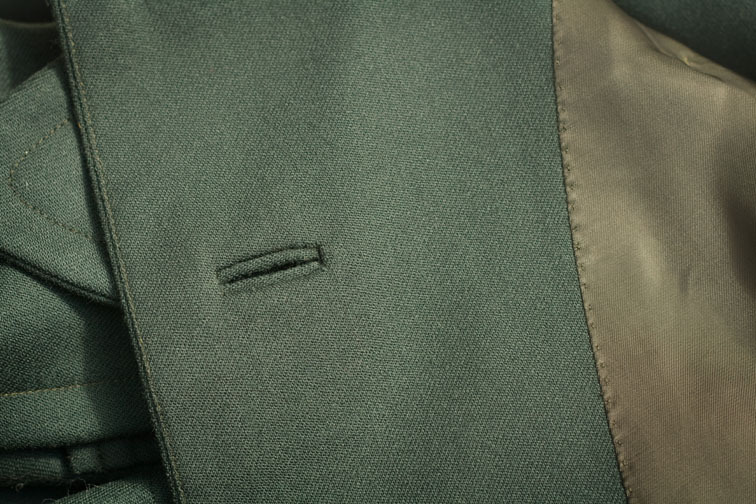 I particularly like how flat the finished appearance is – both the buttonhole welts and the area around the buttonhole have a similar finished thickness. This equalising of bulk helps to reduce pressing impressions, and makes this method suitable for heavier weight fabrics. Hope this helps for happier sewing! The Last Gasp of Winter Cape! Wow! What a great pictorial! Thank you for taking the time to share your techniques with us. Lovely, this is how a tailor here in my city taught us in a tailoring class as well. Her welt pockets and bound buttonholes were gorgeous, as are yours. Great info! Your buttonholes are wonderful! Great tutorial, the result is outstanding. Thanks for sharing once again. Fantastic. Makes me want to go start a coat right now. Wonderful tutorial, you remind me that I haven't done any of those in ages.. This is the best tutorial for bound buttonholes I've ever seen! I love that it is truly 'bound', as before I've only ever seen turning the edges under and making little rectangles into “lips” that add a lot more bulk! Genius! Thanks for sharing your knowledge Sherry. Love the updated tute. Fabulous! Thank you for taking the time to write and photograph this tutorial. Your notes are very clear and the photos are perfectly timed. That,'s exactly how I make them – a friend who trained as a tailor taught me the method. Always love reading your tutorials – Perfection!!! Wonderful! Thanks for sharing. I'm sorry your misaligned first set led to you having to redo them, but I'm glad you were able to perfect your technique. Especially since you took the time to share with all of us. Thanks! Thanks for thaking the time to do another tutorial! I find the facing bit the really difficult bit, lining up the facing exactly… the last time I did a bound buttonhole was using silk hessian which frays like crazy. I beat it into submission but it was not as perfect as your gabardine ones, not by a long stretch! I love the cape although I never got a chance to say so last post. Have you seen any out and about on the streets? They strike me as a good option in an Auckland winter – not so much body heat kept in and a little draftier can be good in our tepid winters. I've recently 'mastered' bound buttonholes. They are my favourite option for coats etc. Your method has refined some of my problem points – ie. those pesky corners. I agree with Mary Nanna that you are the 'queen of tutorials'. Always well presented and methodologically correct. Sherry, your tutorials are so clear and i have printed this for my reference. I would really love to see how you complete a collar stand too, including grading of the collar itself. i know in a previous entry you said you would do one and am hoping it will be sooner rather than later. thank you for sharing your knowledge. Look forward to more tute's…. Sherry, another great tutorial! I will try your method very soon! I like this method better than the previous one. Thanks. Wow! You make that look so easy! Even if I never use this on anything, I so have to try this so I know how to do it! Thanks for a great blog. I'm loving reading all your handy tips.